I was chatting with Adam Strong, and he let me know he has had some success selling domain names through Afternic. He just started listing some of the domain names from his portfolio a couple of months ago, and he has sold five figures worth of names. On one of his sales, he was chatting with the buyer, and she mentioned that she learned about his Afternic listing after receiving an email from GoDaddy. I just received word that Afternic has increased the price you can list domains for sale on its Fast Transfer Network from $25,000 to $50,000. Domain names listed for sale on Afternic can now have a buy it now price tag of up to $50,000 to be eligible for the convenient fast transfer service. The Fast Transfer Network is a service that allows domain owners to list their domain names for sale via Afternic and have them listed in the domain search flow at partner domain registrars. When a customer opts to buy a domain name listed for sale in the network, the purchase and transfer process is relatively seamless for the domain name owner. This makes deals easier to transact. For the last couple of weeks, I had difficulty accessing the Afternic website. I posted a note on Twitter asking if others had the same issue, and I was relieved to learn that a few others were also unable to access the website because it seemed like an isolated issue. When I checked Afternic’s status on Down For Everyone Or Just Me, I saw that the site was operating. I was also able to access Afternic when I was on my iPhone. I noticed a new Afternic “domain for sale” landing page I thought I would share with readers. As you can see below, the landing page does not have any pay per click advertising (PPC) on it, and the lander makes it very clear that the domain name is for sale. 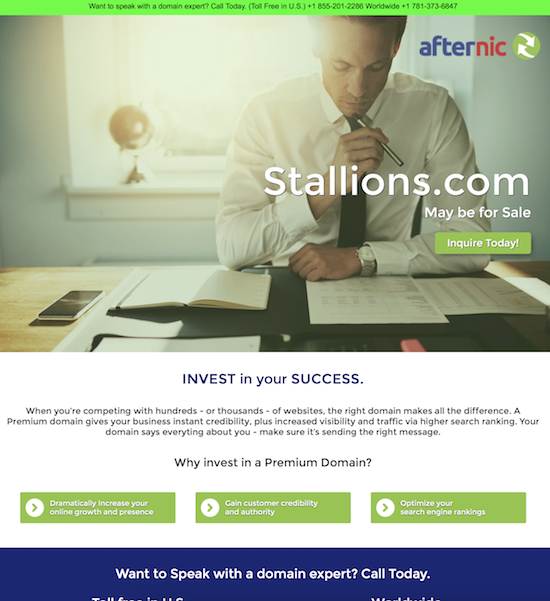 You can visit Stallions.com to have a look at the landing page in action. On the top of the landing page, you can see the call to action with a phone number to call an Afternic sales associate. Afternic likes to encourage people to call rather than submit their contact information via form. Their sales team is likely very strong on the phone, and getting someone to call is a good way for the company to sell its domain names.